Myanmar is a land dominated by Buddhism, family, and tradition all the while becoming modern, worldly, and tourist friendly. You may have heard horror stories about ethnic cleansing, warring factions, and rebel groups, but the truth is not any easier to spot during a visit. Most of the stories come from more remote areas of the country and Myanmar has a firm grip on where tourists can visit, quickly closing down state borders if the government deems it not safe for tourists. In recent history, much of Myanmar was completely closed to western travelers but now, thankfully, many new areas are being opened and tourism is encouraged. A sort of “tourist trail” has been established and with the ever increasing number of visitors this trail is becoming much easier to access. In Myanmar the people walk slower; the bells chime in gradual, low, sturdy waves. Smiles are real and gestures sincere. Here you'll find many aging yet "enlightened" Western Europeans. 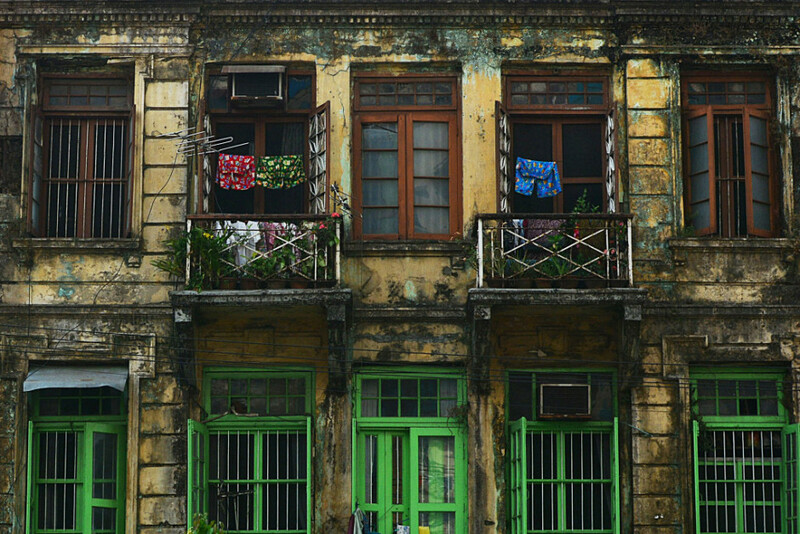 Yangon is where most visitors get their first impression of Myanmar. Most international flights land here and it is a good location for starting off your trip. Yangon does not apologize. It’s gritty, busy, and full of character. The city is strewn with pagodas like a gaudy gold necklace and the colonial remnants of a darker time now shine bright with beautifully textured, smog streaked walls of dated British architecture. Finding poverty in back alleys and along rail tracks can be juxtaposed to the elaborateness of the newly renovated posh hotels. Tea-goers, produce stands, and peddlers clog the sidewalks making walking a tedious but interestingly scenic activity. With a wide range of menus, Yangon is also a great place to introduce your pallet to Myanmar cuisine. 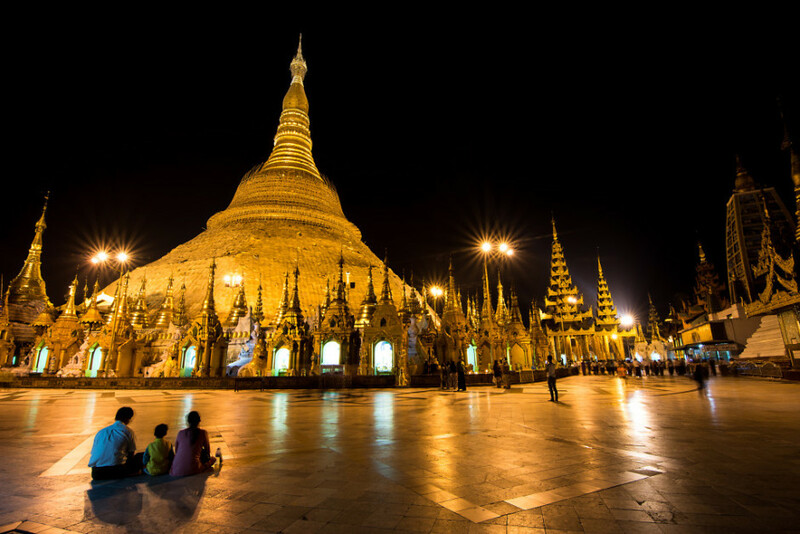 Shwedagon Pagoda is the crown jewel of Yangon. The epicenter of Yangon’s spiritualism, this pagoda is a revolving door of monks, pilgrims, and spiritualists, all dotted with meandering tourists gawking, neck bent upwards, at the bejeweled spire which contains over 7,700 precious stones and is said to house eight of Buddha’s hairs. 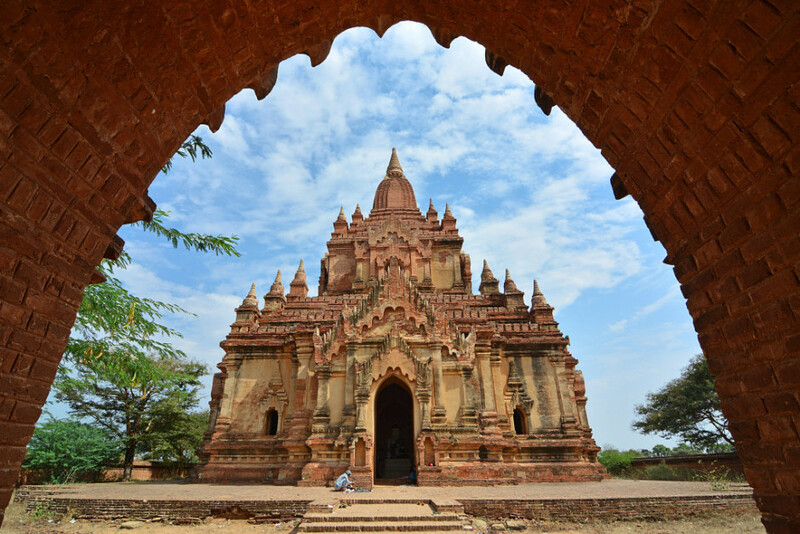 Bagan was once the capital of the Kingdom of Pagan, the first kingdom that united the regions to what is modern-day Myanmar. 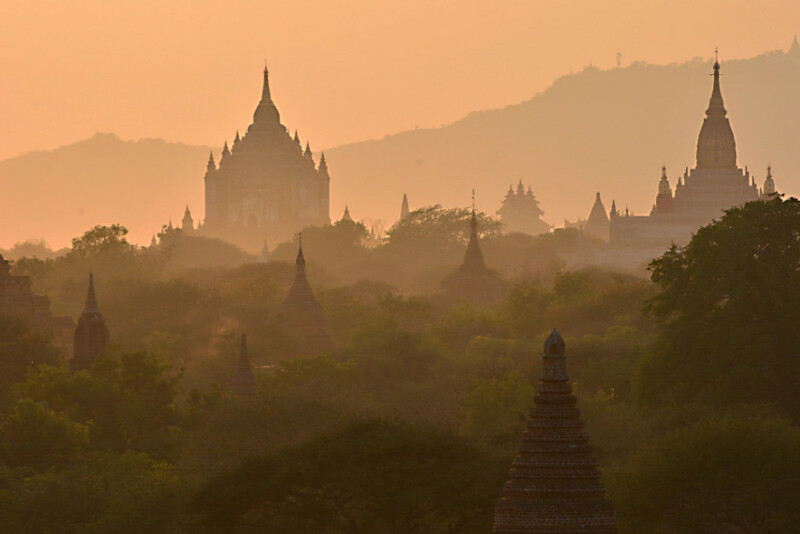 "If you are a real Myanmar, you must have been to Bagan," is a popular saying in the country. 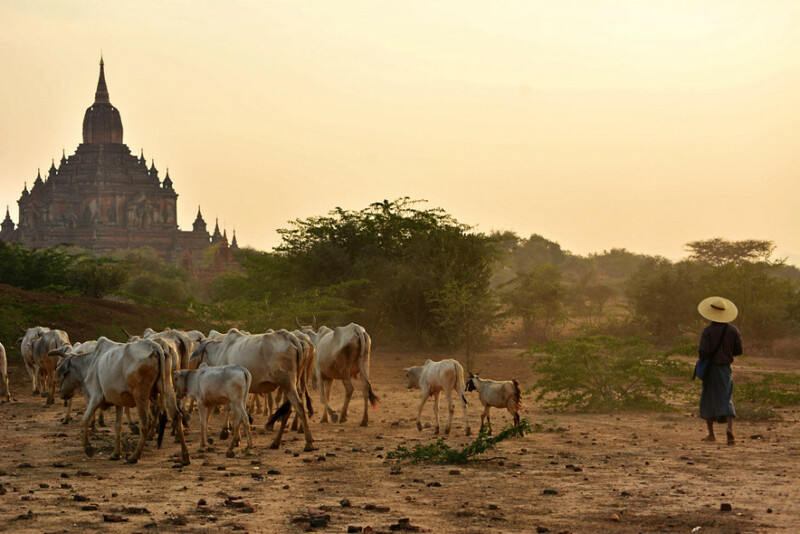 Bagan—a 40-square-mile area that at its height consisted of over 10,000 temples in the 13th century—is a natural traveling progression from Yangon. Today the most visited areas are not so spread out and around 2,200 temples remain. The popular activity here is waking up before sunset, finding a deserted temple roof, and relishing in life as the sun crawls through the clouds and warms the landscape. After breakfast, rent a bike and and explore the plethora of temples until your camera battery runs out then cool off in a garden cafe. Or you could become a part of your sunrise vista and hop in a hot air balloon for a 45 minute cruise above mysterious temples and reddened earth. Onward from Bagan you might find yourself next heading for Mandalay. The governmental seat of the country and home to most of the countries monks, Mandalay is a dusty, bustling, charismatic city that is a great home base for many excursions that can be had around the area, one being south of the city: U Bein Bridge. 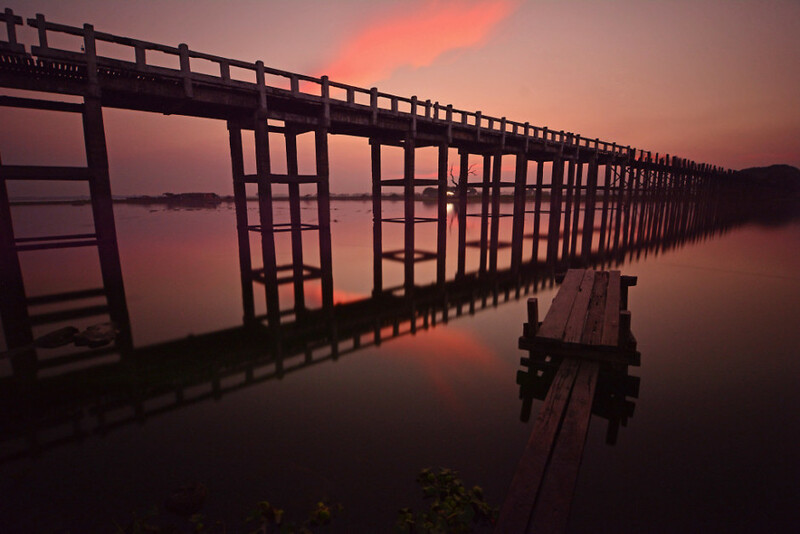 It is the longest teak bridge in the world, made mostly from leftover wood from the building of the royal palace. The bridge is heavily used by locals and monks but has now been claimed by tourists as well. Many visitors drift out in a hired boat to photograph the silhouettes iconically back-dropped by a blazing sun. Suggestion: stay late and you’ll be amazed at how quickly the throngs dissipate, grab a lake-side seat and a bubbling beverage and enjoy as the lake soaks up the sky’s gloaming colors. A short trip up the Irrawaddy River from Mandalay is the town of Mingun, site of the beautifully destructed stupa of Pahtodawgyi. Building started in 1790—much to the bane of the locals who were heavily burdened by the project. They took advantage of a very superstitious leader and created a prophecy which stated that the completion of the stupa would coincide with the end of his reign as leader. The king eventually died and the project was abandoned, but the stupa still holds the record of being the largest pile of bricks in the world. 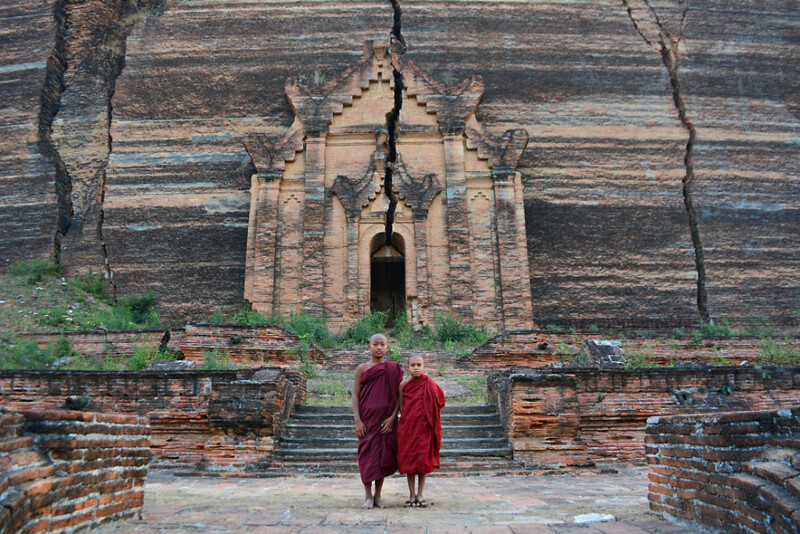 Pahtodawgyi’s characteristic cracks came from an earthquake in 1839 and the damage was seen as too much to repair. Now those cracks serve to benefit the area by attracting tourist dollars. Lake Inle is a quick flight or an overnight bus from Mandalay. The most common place to stay is actually a few kilometers from the lake in a town called Nyaungshwe. The 116 square kilometer lake is settled with entire villages of houses, schools, and monasteries posted above the water, complete with public transportation and floating gardens. 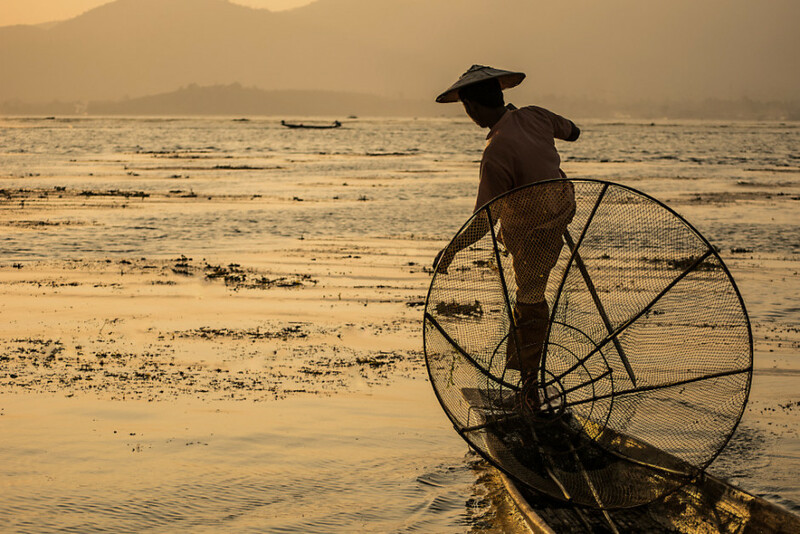 The lake is only an average of five-feet deep which has lead to the most recognizable sight from Lake Inle, that of the local fisherman balancing cone-shaped nets and paddling along with a single leg wrapped around an oar. 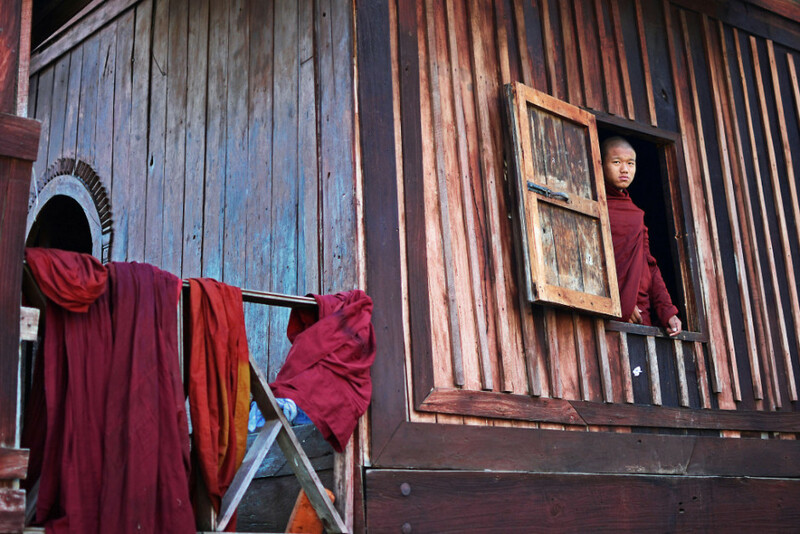 This modest monastery is an enjoyable 20-minute bike ride outside of Nyaungshwe and at the time of my visit was home to around 40 boys preparing themselves for monkhood. Around Lake Inle there are some famous inhabitants belonging to the Kayan culture. 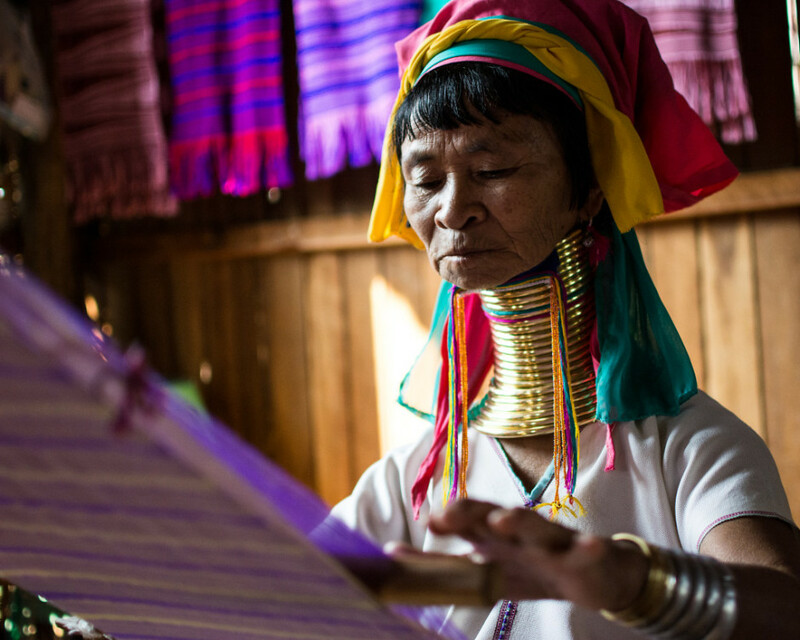 Most of the Kayan women who practice the tradition of wrapping brass coils around their necks live around the city of Loikaw south of the lake which is reachable by boat via a trip down the river. 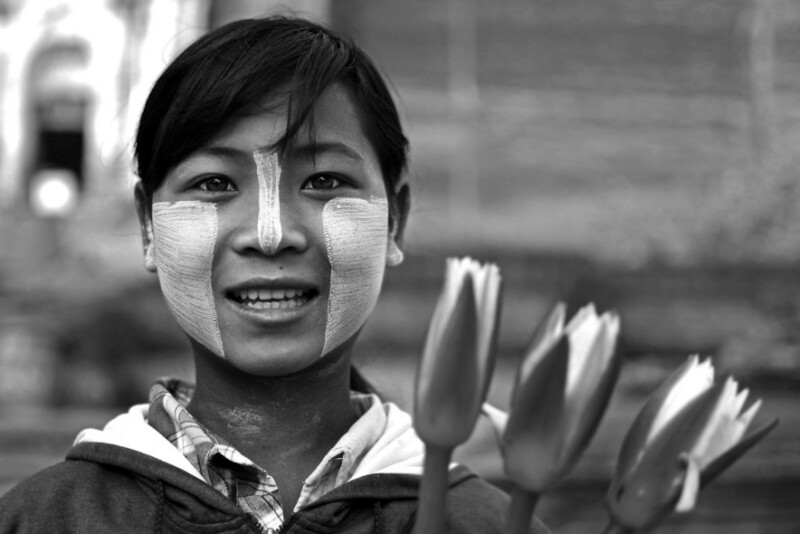 You can also find them on a traditional loom making scarves or a Myanmar longyi. Myanmar has nearly 2,000 km of coastline and many good beaches to complement it. The most popular and arguably the most attractive of these are located in Ngapali Beach; however, it is not the most accessible and normally requires a domestic flight. 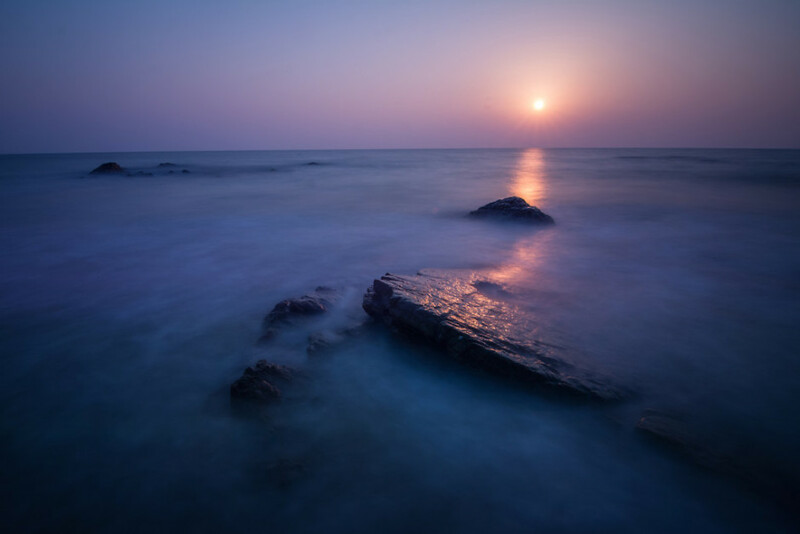 For those on a budget, there are two other popular and worthwhile beaches within a six-hour bus ride from Yangon: Ngwesaung Beach and Chaung Thar. Smiling is a heavily practiced greeting here and it can often be accentuated by proudly worn Thanaka smeared across the head and cheeks. Thanaka is made from a ground up bark and used to protect the skin from the sun and also delivers a cooling effect that helps during the dry heat of the summer afternoons.